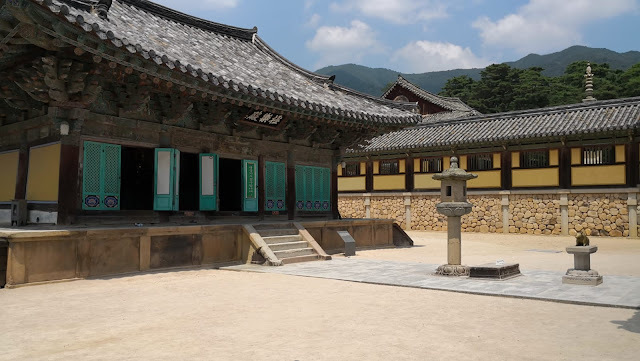 Looking for some suggestions on what to visit in South Korea's historical city of Gyeongju? Here are some suggestions from my own experience in the town. It is not an exhaustive list it but should give you some idea of where to start. For context, I stayed 2 days and 2 nights in Gyeongju, traveling to the different attractions purely by public transport. 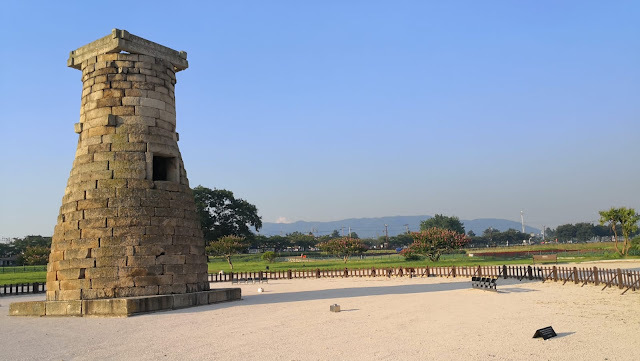 What it is: The Cheomseongdae Observatory is a structure built around 632-647 during the reign of Queen Seon-deok of the Silla Kingdom, Korea's earliest complex civilization. It was used to forecast weather by observing the stars. Today, it is one of the few remaining relics from the ancient Silla Kingdom, designated as one of South Korea's National Treasures. At 1300+ years old, it is also during this period when the Islamic civilization was rising to power and China was ruled by the Tang Dynasty. Review: While the structure is historically significant and quite a sight to behold (after all, it is older than me by a millennium), I find the experience of visiting the place to be a little underwhelming. It might be due to my expectations prior to visiting the place as I read about it online, but I also guess I did not do my research enough. The observatory stands solitarily in the middle of an open-air park, with not many other things around it. While it makes for a good picture opportunity, I don't think this is a place worthy of visiting on its own as you will spend at most 30 minutes here. There is a board explaining the structure but that is about it. Would strongly recommend the observatory as part of a larger itinerary. 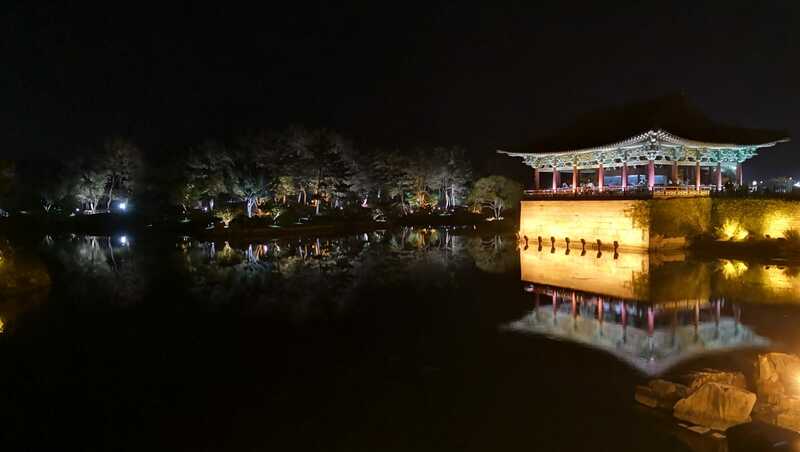 What it is: Donggung Palace and Wolji Pond used to be a secondary palace for the royals during Korea's Silla Period. 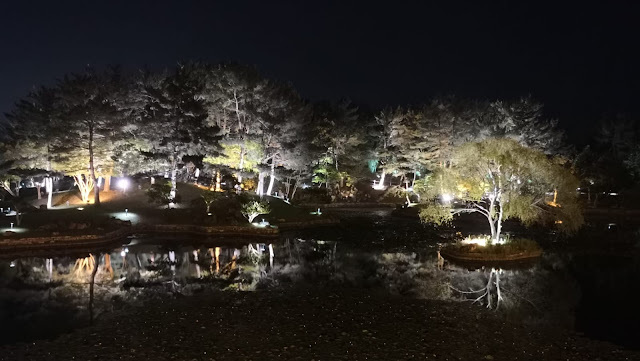 Today, the place is a reconstruction of the ancient palace that gets turned into a magical light display during the night. Buildings and trees are fitted with colourful lights that form a beautiful reflection on the still waters of the lake. Review: No doubt the place is really pretty and they also offered a brief history to the place, but wouldn't say that it's entirely really unique or different. It's just pretty. There will also be loads of crowd during the night as many tours come here, so you'll sometimes need to jostle for a photo-taking spot. Make sure to bring a camera that can function well at night if you want to capture the photos of this place. Additional tips: You can reach this place via public transport (a quick google search will help) and you'll need to pay an entrance fee as well. 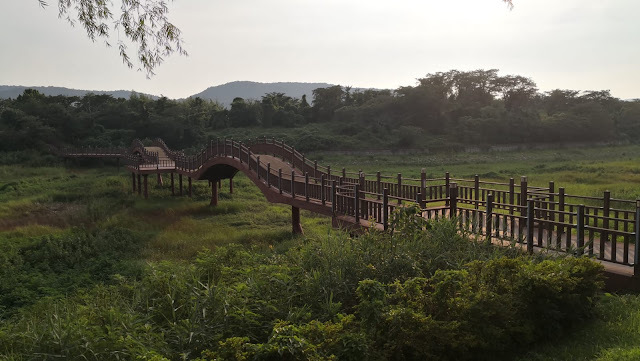 The place is like a park where visitors will need to follow a path to cover the place. As the lights are the biggest selling factor, be sure to visit the place at night too. 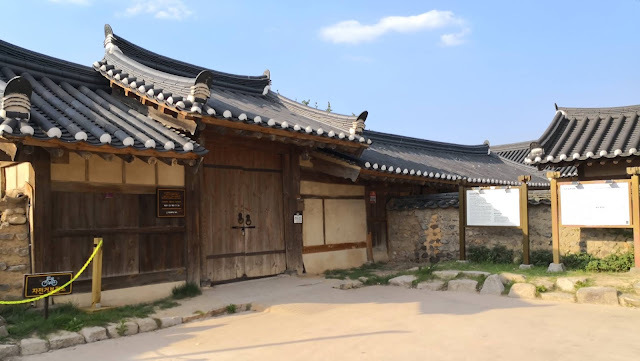 Intro: While many sites would list Bulguksa Temple and Seokguram Grotto as different places to visit in Gyeongju, I would see them as a place to visit together due to their proximity and relationship to each other. Both sites possess a rich history to them, which is why they are both listed as UNESCO world heritage sites. 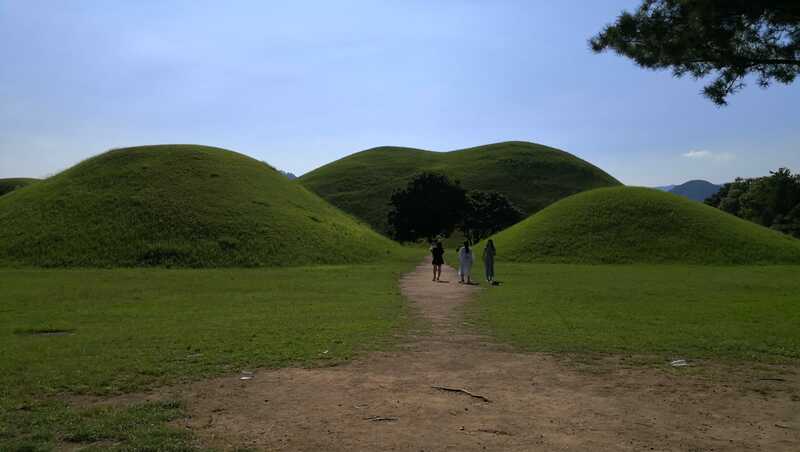 They are highly recommended as places to visit in Gyeongju due to the historical value that they both carry. Review: It was quite an interesting experience, walking on the same ground as people who have come hundreds of years before you. 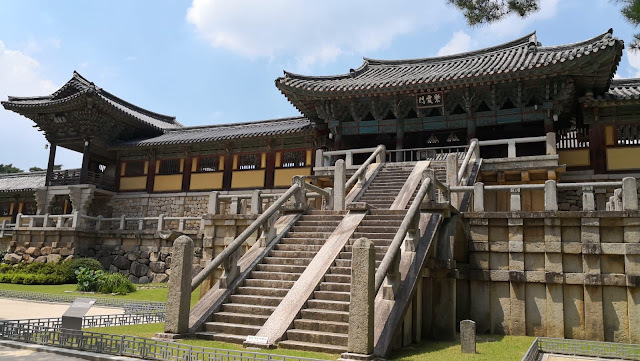 The architecture of Bulguksa temple reminds me of the architecture of the Buddhist temples in Cambodia's Siem Reap, in how there is a main building in the middle flanked by pagodas and with stone stairs leading up to the complex. The entire area of Bulguksa is big with different halls for different deities. The entire temple felt calming to visit, with plenty of opportunities to take artistic pictures as well. I was particularly amazed by the rock formations that they did in one section of the temple. Seokguram Grotto on the other hand, however, felt slightly more underwhelming as it was only a section of the original structure that we can see, locked behind a panel of glass which you cannot take pictures of. We expected to see more at Seokguram and the entire experience only took less than 30 minutes. This is why I highly recommend visiting both Bulguksa and Seokguram together. The view from Seokguram, however, was nice and breathtaking. Additional tips: There is a bus running hourly between Seokguram and Bulguksa (Bus 12), which makes traveling between the two places much easier. There is also a food area near Bulguksa for those who are hungry. You can take public buses to Bulguksa from either the downtown area or the Bomun tourist complex. Wear comfortable shoes as there are some hiking involved. Intro: The Daereungwon Tomb Complex is something like the pyramids to the Koreans, where the royals of the ancient Silla Kingdom are buried under. From afar they may look like normal mounds, but make no mistake, these mounds are considered sacred and important to the local people. In fact, running on them would bet you millions of won in fine! There are many of them around the small town of Gyeongju, each varying in size and height. Review: While it is quite humbling to consider the history behind these tombs, only viewing them from afar seems to be quite underwhelming. Unfortunately for me, I did not get a chance to see the tomb from the inside, which I guess affected how I remember the entire experience. It is also somewhat disappointing to not know which tomb belonged to who, as we only got to see mounds of grass. If you do plan to visit, make sure to visit one of the tombs which you can enter! 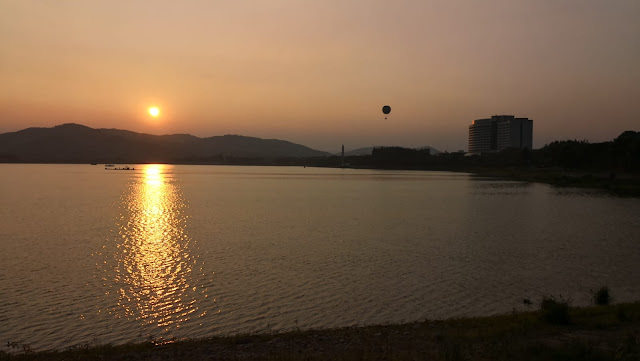 Intro: Bomun Lake is one of the most popular attractions in Gyeongju. Surrounded by hotels and resorts, Bomun Lake is known for its beautiful scenery. If you come during the spring season, you will be greeted with beautiful sights of cherry blossom doting the lake. Romantic and breathtaking. Just google Bomun Lake and you can see it for yourself. However, that is just for spring, which brings me to the next point of my review. Review: We visited Bomun Lake in the summer and to our disappointment, it was nothing like what is pictured online. Part of the lake was dried up and gave way to vegetation, and it felt no different from any other parks with a lake. I guess this is because we did not do sufficient research online, without realizing that summer is definitely the period to avoid if you plan to visit the lake. The place was just quiet during our visit. Not that I am complaining, but it's always good to be sufficiently informed before a visit. Still, we did manage to catch the sunset over the lake, and the walk around it was calming due to the lack of people. But we guessed the place would have been a lot prettier during other seasons except summer. Intro: Gyochon Hanok Village is a tourist attraction in Gyeongju shaped in a traditional Korean Village style. These traditional buildings house a variety of cafes, shops, and museums for tourists. You can walk around the village just soaking in the atmosphere and deciding what you want to buy/eat/do. If you're a fan of history, there is also a preserved house from many years ago for you to visit. 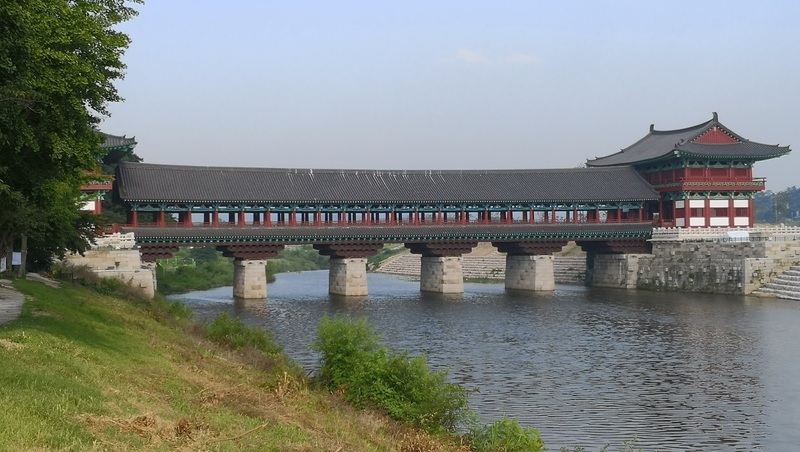 Woljeonggyo Bridge, on the other hand, is a scenic spot not far from Gyochon where you can take cool pictures of! Review: The village is not a bad place to hang out in as they offer visitors a variety of things to do. You can even dress up in traditional Korean costumes to roam around the village for photo opportunities. You can eat ice-cream, play with dogs or just admire the architecture of the place. Do take note though to get to the village before 4pm, as many shops and attractions close by 5pm.